It is possible this could fall under the Thematic Arts section. But this contributor believes that even though the print is evocative of the plight of the bird, that the subject (the bird) makes it hard to see this as a metaphysical statement about human life, even though one could stretch it and thus put it in the Thematic Arts section. Artist has other names (Hoson instead of Shoson), and it is unclear if his first name is thus, or whether Ohara is his first name. His actual birth name was something other than any of these. 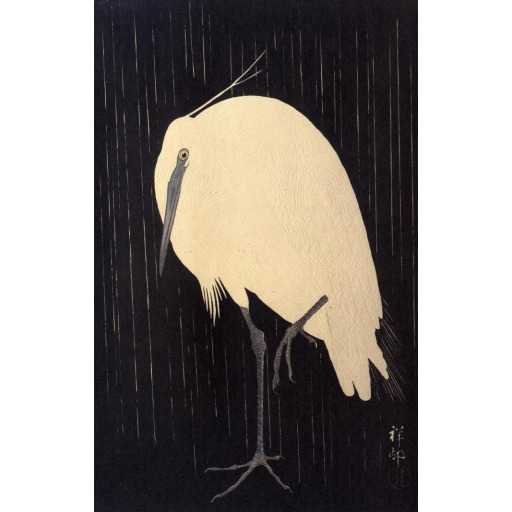 A huddled bird (crane or egret) in a downpour. Black background with light streaks of the rain strongly defines the mass of the bird's body.